This is the gift for you! • This product is a perfectly sized 8"x8" wood frame. 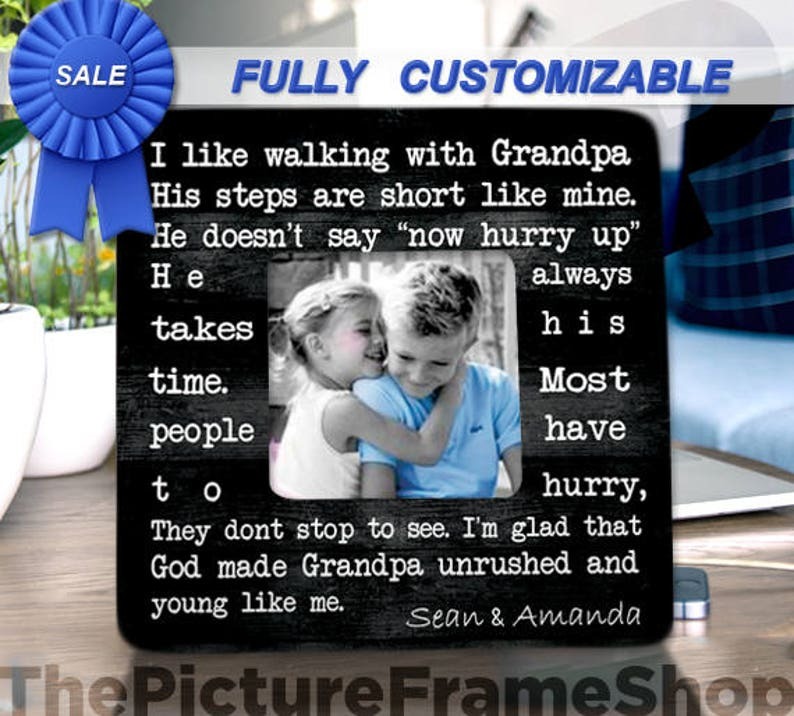 • Each frame is personalized to the exact wording you want. • Each frame holds a picture just under 4"x4" for awesome memories. • Our designs are permanently bound to the wood using a heated treatment process, making this frame highly durable. • Some shops glue paper to untreated frames, but we use high quality materials and processes on all of our products! • Customized unfinished frame with natural wood. • Customized frame with matte black finish on back and sides. • REAL GLASS insert to protect your picture. • Custom made EASEL BACK STAND and wall hanger. - Let us print and size your photo here! - Need us to wrap this? Add a wrapping option here! - Need this in a hurry? Add rush shipping here! • Include exact wording for your frame. • DOUBLE CHECK names, dates, etc. • MAKE CHANGES to ANY words you do not want in the sample. • Include the BACKGROUND NUMBER you want for your frame. • Include the add ons you plan to order in the notes to seller, and tell us if you want a proof. • DOUBLE CHECK YOUR SHIPPING ADDRESS. Our picture frame came out amazing! I wish I knew how to post a picture of it! She was very easy to work with and sent it super fast! Will definitely order from here again! I am a repeat customer and couldn't be happier! The uniqueness of these frames, and ability to personalize, with a nice size photo opening, I love this frame! No one else I know will have this sitting in their homes or work spaces. Theirs will likely say something different! My daughter's grandpa and my mom both liked it alot. My only wish is that I should have asked to have it read, "grampa," because that's how children say it! But that was my fault. I forgot to ask. Beautiful product. Amazing customer service!! All of our items are made to order and, therefore, are not refundable. Although rare, If there was a mistake made by ThePicureFrameShop,--like wrong dates or misspelled names-- please EMAIL us through Etsy with a picture of the frame, and I will gladly replace the item free of charge. The replacement frame will ONLY be created with the specifications from the original purchase. Any variations from the original order will require a new purchase from the customer. Although we package each order with the best of care, we cannot be responsible for conditions out of our control including delivery dates and lost or damaged packages. This includes packages left out in the rain or snow, or packages sent back to me for any reason. All items are sent either Mail via USPS or UPS and all have a tracking number that will be listed in your receipt via Etsy once shipped. Please keep in mind that once an order has been shipped it is no longer in my hands. I cannot control shipping times and I can only go by the estimated delivery dates given by the post office/UPS. I can guarantee the ship date but not the delivery date. Customers are responsible to provide a correct shipping address. I am not responsible for any items being lost, stuck at the post office, or returned to me. If a returned item needs to be sent out again, the customer must purchase the shipping. Q. What makes your frames different than most other shops? Q. Can I customize my frame? A. You can chose any color or saying; we can change names, dates, etc. Q. Can I get a refund on a ordered product? Q. Do your frames hang? Are your frames just paper that is just glued onto the frame? This is a large step-above the shops that only use a glued-on paper process! FRAMES CAN NOT GET WET. Wetting the frame will damage the frame. Dust frame with dry cloth only. Do not spray frame with cleaner of any type. ThePictureFrameShop is not responsible for frames damaged by exposing them to water or any type of moisture. What is the difference between the Basic and Premium frames? Yes, we do! The frame itself would be wrapped in general paper and jute. It will then be placed in a general gift bag with colorful tissue paper and ribbon. Where do I tell you the customization I would like? The "note to seller" box can be found after you've added the item to your cart. If you're purchasing on a desktop, you will see a text box below the item photo. If you're purchasing through the app, you will see an opening above the item total. If you miss this during checkout, please message me after purchasing. What is the size of the frame and the photo it holds? The frame is 8"x8". It holds a photo that is 3.7" X 3.7"
I have given you the wrong shipping address. What should I do now? To protect both you and me, I must ship to the address on the order. If your purchase is meant as a gift, please confirm the correct shipping address is on the order. Once the order is placed, shipping addresses can't be changed. The order would have to be cancelled and reordered to make any corrections. It is the buyer's responsibility to supply the accurate shipping address. If buyer supplies incorrect shipping address on order, no refunds or replacements will be made when tracking confirms delivery. How do I get the correct size photo for your frame? Will the color I choose look EXACTLY the same as on my computer?